The original screenplay was written by Christoph Fromm but the producers disagreed with his more realistic direction and had it rewritten. Consequently, Fromm took his name of the film. Errors in geography: At the beginning of the movie "Porto Cervo" is indicated as the location where the German army is located. But the city is clearly Cervo, in Liguria. Porto Cervo is in Sardinia. Otto: Welcome to our grave. I can believe this movie will be a serious disappointment for a person, who is used to and likes to watch Hollywood war movies. Four reasons: 1. It's made in a world, where movie makers tries to have some personality. If you think 'When We Were Soldiers'... well, there are hundreds of directors who you can imagine making a similar war movie with personality and values of a hamburger. 2. Screenplay has a different structure. There's no shocking opening scene like in 'Saving Private Ryan'. This movie starts slowly in a very nice place and ends slowly in a very bad place, without hope or feeling that the characters have achieved something by their heroic actions. 3. 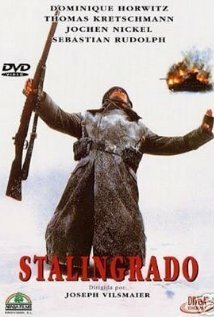 It is first a movie about lost causes in the world of war, and only secondly a war movie which takes place in Stalingrad. 4. War scenes portray the horror, insecurity and confusion of a battle, instead of how cool, heroic and exciting fighting looks like. In this sense, this movie is closer to reality than most of the war movies you will ever see. 'Thin Red Line' also had similar "I would probably crap in my pants in that situation"-feeling.